A mess ‘o marshmallows makes this silly sheep. What You Need: 1 cupcake; chocolate frosting; about 20 mini marshmallows; 2 black, candy-covered licorice pieces (such as Good ‘N Plenty); 2 blue mini M&Ms; bit or red licorice or other candy. How to Make It: Frost cupcake. 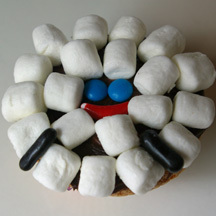 Arrange marshmallows in two concentric circles, leaving a little space in the middle for eyes and mouth. Add M&M eyes and red candy mouth. Add candy-covered licorice for legs. This entry was posted on Friday, May 1st, 2009 at 12:30 pm	and is filed under animal cupcakes, Easter cupcakes. You can follow any responses to this entry through the RSS 2.0 feed. Responses are currently closed, but you can trackback from your own site.